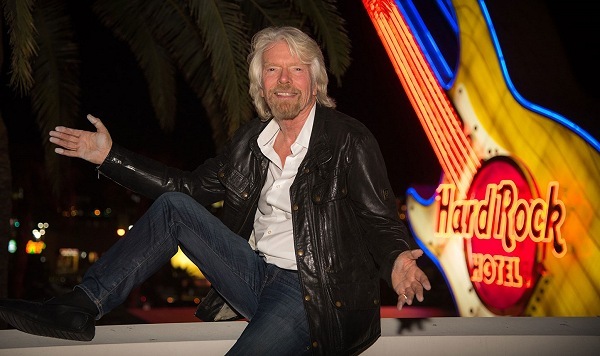 British billionaire Sir Richard Branson’s Virgin Hotels announced late last week that it was acquiring the off-Strip hipster casino property Hard Rock in Las Vegas for an undisclosed sum. It will be Branson’s first venture into the gaming industry. The 67-year-old Virgin Group founder has long wanted to control a casino resort in Las Vegas. It’s been more than two decades since Branson first expressed such interest, but he’s only now officially placing his bets on Sin City. Branson, whose fortune is estimated at $5.1 billion, has long been engaged in business in the Nevada gaming epicenter, albeit not from a direct gaming angle. His airline Virgin Atlantic has been bringing travelers in and out of Las Vegas’ McCarran International for decades. In 2017, the airline was responsible for more than 1.1 million passengers. Last year, Branson also became a major investor in Hyperloop One (renamed Virgin Hyperloop One), a company that hopes to build underground high-speed rail service featuring “pods” that travel nearly 200 mph. One of the first proposed routes would connect Las Vegas to Los Angeles. But while Virgin Hotels launched in 2010, today it only has one property in its portfolio, the 250-room Virgin Hotels Chicago. Nine more locations are in the works, however, with six (including Virgin Hotels Las Vegas) expected to welcome guests by 2019. 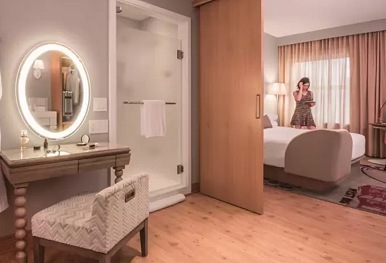 As with its Chicago hotel, the Virgin Hotels property will feature guest “chambers,” in which rooms are divided by a sliding door into one section for sleeping and the other section that includes the bathroom and a mirror-and-vanity setup. In all, the Virgin Hotels Las Vegas will have 1,504 chambers and suites as well as a 60,000-square-foot casino and multiple pools. The hotel’s lounges and restaurants will include a Commons Club, which in Chicago is a restaurant “study” during the day and a nightclub after hours. Virgin Hotels, along with Juniper Capital Partners and Fengate Real Estate Investments, acquired the Hard Rock from Brookfield. Virgin said “hundreds of millions” of dollars will be spent on upgrades. The Hard Rock opened on Paradise Road about a mile east of the Las Vegas Strip in 1995 with Pamela Anderson, Tommy Lee, Jack Nicholson and George Clooney in attendance and Weezer, Duran Duran, Melissa Etheridge, Sheryl Crow, B.B. King, Billy Idol and Seal playing musical sets. The hotel, which underwent some renovations in 2016, will remain open and will continue to operate under the Hard Rock brand until the conversion is complete. Virgin Hotels opened its property in Chicago in early 2015. The company is adding a hotel in San Francisco later this year. Along with the Las Vegas rebranding, Virgin Hotels will add properties in Dallas and Nashville next year.